Steam Cleaning gives a really Deep Clean. Every kitchen surface, including inside and outside of ovens, refrigerators, freezers, fryers and filters are cleaned, de-greased and sanitised to the most exacting hygiene standards. Heavily baked on grease can be removed. Steam super-heated to 150°c leaves fittings, panels, and tiled surfaces (including grouting) clean, sanitised and shining. Our washroom cleaning removes the build-up of body fats and scale, soap residues, mould and bacteria including grouted areas of tiled surfaces. 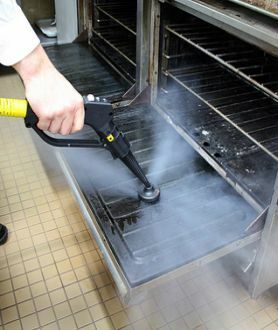 Ideal Solutions can clean, remove stains and sanitise all areas of kitchen and washroom facilities.